Embark on a journey to discover Italy’s heart, rich of forest, monuments and history. Festivals and folklore to know and delicious food to taste. Paciano Paciano is a nice village surrounded by vegetation, nestled on Mount Petrarvella at 391 meters high. From its position you can enjoy the panorama of Lake Trasimeno, just 6 km away. Paciano Paciano keeps its medieval structure intact to these days: the walls (more than half a kilometre), 7 towers, 3 access doors and the town centre with a chessboard structure with 3 parallel roads crossed by characteristic alleys. The 3 old doors are Porta Perugina, Porta Fiorentina and Porta Rastrella, name that is thought to come from the heraldic “Rastrello” over the same door. Not very far it’s possible to admire the lakes of Chiusi and Montepulciano and a part of Valdichiana. Before crossing the castle walls, we find the old church of San Sebastiano (X sec. ), where the remains of a fresco picturing San Sebastiano are keeped. Following the road once called Aureliana we reach the romanic church of Santa Maria Peretula (today Santa Maria Assunta) with paintings from Guglielmo Ascanio. Going further we cross Porta Fiorentina that brings us in the historical town center, and after a while we get to Palazzo Baldeschi, that houses the Museo Naturalistico. In Piazza del Municipio we find the Confraternita del S.S. Sacramento, where two board from XIII century and a fresco from 1452 are keeped. Going back down we reach the church of San Giuseppe, the first to be built inside the walls (and so called “La Chiesa Dentro”), where the “Gonfalone del Bonfigli”, alleged work of Fiorenzo di Lorenzo is keeped. The curch of San Carlo Borromeo is just a few steps away. Reaching Porta Rastrella, we find Palazzo Cennini, renaissance style structure characterized by great lodges facing beautiful gardens, and finely decorated rooms. Another church that needs to be remembered is Madonna della Stella, from 1562 and with frescoes from Silla Piccinino. From Porta Perugina, up the hill, we find a beautiful portal from 1770 called “della Madonnuccia”. Near there there’s the majestic Torre di Orlando, with crenellated tower, representing the ancient castles of Perugia. Next to the Torre there’s the Convento di Sant’Antonio, built in 1490 by Franciscans; down the hill there’s the church of San Salvatore, also called “del Ceraseto”. The history of Perugia starts with the Etruscans, which left lots of remains on the territory, between these the walls, surrounding the town and still visible near the most important doors. Perugia was the town of Pietro Vannucci, Italian painter from the XVI century known as “Perugino”, owner of two very active “botteghe” in Florence and Perugia, he gives his name to the main road running through the town center. The city is built on a hill and still shows hints of roman architecture, especially in Corso Vannucci, old Cardo Decumano (roman main road) of the city. 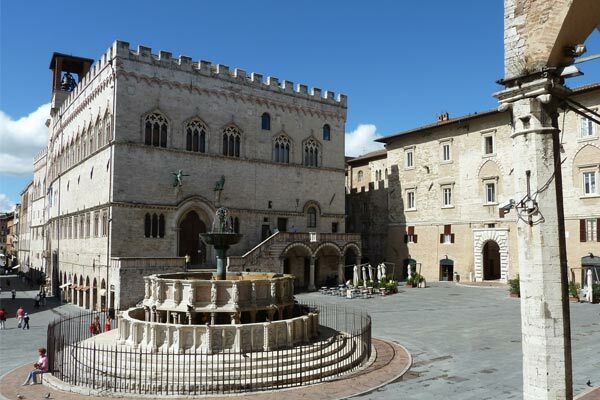 Interesting point of the city are: Palazzo dei Priori, building of communal era; Fontana Maggiore, the most important symbol of Perugia, in the middle of Piazza IV Novembre; and then churches, the Cathedral of San Lorenzo, theatres, monuments and libraries. Home city of S. Francesco d’Assisi, patron of Italy, it’s a really religious and artistic location. 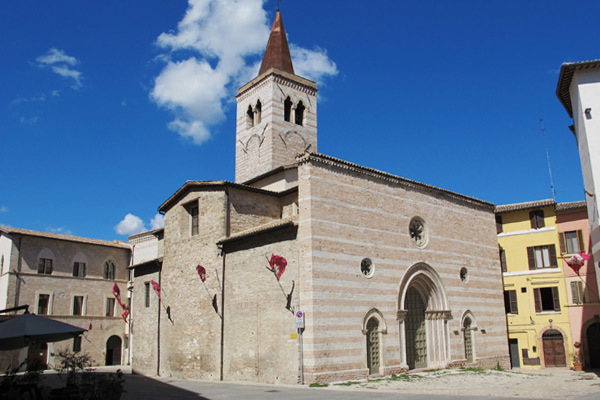 Most important attraction of Assisi is the Basilica di San Francesco, dating back to the XIII century, which keeps the holy relics of San Francesco and the frescoes of his life. The paintings of Giotto and Cimabue, in the Basilica Superiore di San Francesco, are important pictorial testimonies. 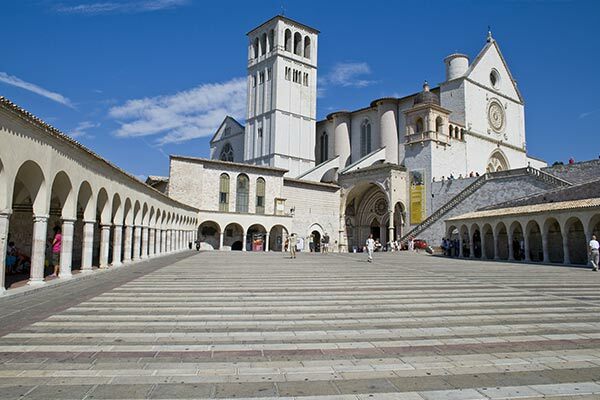 Assisi is the favorite destination of pilgrimage for tens of thousands of devotees every year. Foligno, third city of Umbria, is situated in the middle of the Umbrian valley and is crossed by the Topino river. Foligno is the richest and most important commercial and industrial pole of the Umbrian valley and the main center of communication for the whole region. It boasts one of the oldest town center in Umbria, that thanks to its modest size, can be visited in just a day. Foligno is part of the circuit “Città dell’Olio”.